The prototype human body communication device sends data at up to 100kbps through a radio field on a person's skin. When they touch an object or person with a suitable transreceiver, data can be exchanged. The device is on show at this week's Ceatec electronics show in Japan through several color-coded demonstrations. Panasonic staff demonstrate a prototype human skin transmission system at Ceatec in Japan on October 3, 2016. In one, for example, a person can hold a color-coded ball. When they touch a sensor connected to a lamp, data on the color of the ball is sent to the lamp and it changes color to match. The demonstrations are simplistic but prove the system works. 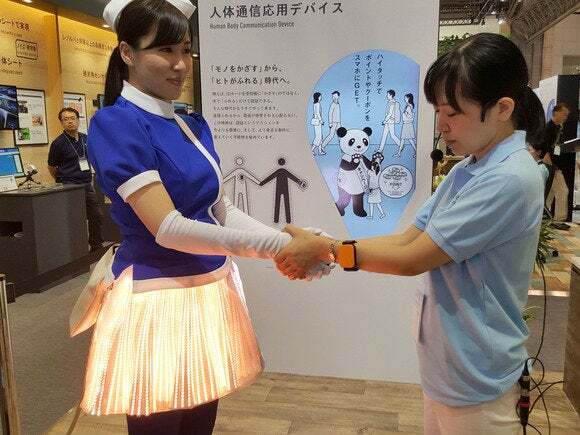 Panasonic envisages it might be used in the future for more practical purposes, such as exchanging contact information with people through a handshake or unlocking a door by simply placing a handle on a door knob. 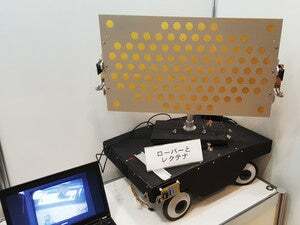 At present, the technology is still too big to fit inside something practical, like a wristwatch or smartphone, but Panasonic is confident it can be miniaturized if there is demand for such a system.